This article is about the former flag of Northern Ireland. For the traditional provincial flag of Ulster, see Flag of Ulster. Red cross on a white field, defaced by a six-pointed star bearing a red hand and ensigned by a crown. The arms and flag were designed in Dublin by Ulster King of Arms Neville-Rodwell Wilkinson in 1923–1924. The flag is based on the flag of the traditional province of Ulster, including a Red Hand of Ulster in the centre, and the red de Burgh cross (though some claim this is the Saint George's Cross). It has the addition of a crown to represent the monarchy of the United Kingdom. Rather than a shield, the Red Hand is inside a six pointed star, representing the six counties that make up Northern Ireland. It is blazoned: "Argent a cross gules, overall on a six pointed star of the field ensigned by an Imperial crown proper a dexter hand couped at the wrist of the second". The flag is also sometimes called the Ulster flag, Northern Ireland flag, the (old) Stormont flag, or the Red Hand of Ulster flag. Loyalists often use 'Ulster' as another name for Northern Ireland, and Stormont was the seat of Northern Ireland's government. 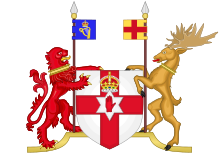 In 1924, the Government of Northern Ireland was granted its own coat of arms by Royal Warrant and had the right to display these arms on a flag or banner. This right was exercised for the Coronation of Queen Elizabeth II in 1953. From 1953 until 1972, the flag was used officially by the Government of Northern Ireland and also as a de facto civic flag for Northern Ireland. In 1972, the Government and Parliament of Northern Ireland were abolished by the Parliament of the United Kingdom under the Northern Ireland Constitution Act 1973. Since the Government of Northern Ireland was abolished in 1972, the flag (and variations thereof) has continued to be used by unionists. In 2004, Belfast City Council commissioned a study on the flying of flags which noted that the Ulster Banner continued to be flown, alongside the Union flag, by three unionist-controlled local authorities in Northern Ireland: Ards Borough Council, Carrickfergus Borough Council and Castlereagh Borough Council. 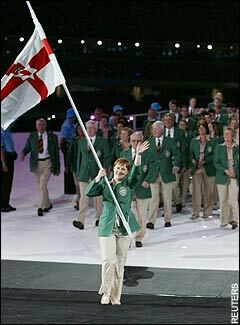 The Ulster Banner is used to represent Northern Ireland at the Commonwealth Games, players on the PGA Tour, and by FIFA to represent the Northern Ireland national football team. ^ Groom, Nick (2006). The Union Jack: the Story of the British Flag. Atlantic Books. p. 295. ISBN 978-1-84354-336-7. ^ "Ulster". Flag Institute. The Ulster flag is different from the Ulster Banner, which was the former flag of Northern Ireland but now holds no official status. ^ Minahan, James (2009). The Complete Guide to National Symbols and Emblems. ABC-CLIO. p. 486. The official flag of the province is the Union Jack. There is no official national flag of Northern Ireland, following the Northern Ireland Constitution Act of 1973, nor any unofficial flag universally accepted in Northern Ireland. ^ McCormick, John (2012). Contemporary Britain. Palgrave Macmillan. p. 53. The old flag of Northern Ireland – a red hand inside a white star on a red cross – has strong connections with the Protestant community, and is no longer official but is still occasionally flown. The official flag of Northern Ireland is the Union Flag. ^ a b Promoting Fair Play in Sport. Sport Northern Ireland. p. 9. Archived 7 April 2013 at the Wayback Machine "Many existing flags have no official status and this includes the former Northern Ireland 'flag' (or flag of the Executive Committee of the Privy Council of Northern Ireland or Ulster Banner) that only had official status during the life of the NI Government between 1953 and 1972, and would be regarded by many as contentious in the current political circumstance". ^ "Flags". Northern Ireland Foundation. It was the official flag of Northern Ireland from then until the Northern Ireland government was suspended in 1972, and has had no official standing since that time. ^ a b "New Northern Ireland flag should be created, says Lord Kilclooney". The News Letter. 17 December 2013. Lord Kilclooney, the former Ulster Unionist deputy leader, is a vice chairman of Westminsters all-party group on flags and heraldry which promotes the flying of the Union Flag. He told the News Letter [...] 'whilst England (St George's Cross) Scotland (St Andrew's Cross) and Wales (The Dragon) have individual regional flags, the Flags Institute in London confirms that Northern Ireland has no official regional flag. It should now be possible to design a regional flag [...] which is acceptable to both communities in Northern Ireland'. ^ "Union Flag (Executive Buildings)". Northern Ireland Assembly. 6 June 2000. Mr Fraser Agnew: The Ulster flag] [...] was a civil flag for Northern Ireland, but its official status was abolished when the Northern Ireland Parliament was closed down in 1973. Thereafter, the Union flag was made the official flag in Northern Ireland. That is a fact. ^ "Northern Ireland (United Kingdom)". Flags of the World. ^ "Bangor man travels the world with Northern Ireland flag". BBC News. 9 September 2013. The red cross on a white background flutters from many a lamppost in Northern Ireland, and is often a divisive symbol between unionists and nationalists. ^ "Find a neutral flag for all of Northern Ireland: Richard Haass issues challenge to parties". Belfast Telegraph. 3 December 2013. ^ "Rory McIlroy PGA TOUR Profile - News, Stats, and Videos". PGATour. PGA Tour. Retrieved 6 August 2018.